Sometimes I want to eat the potato chip. There is something primal in that salty, crunchy texture that goes way beyond snacking. The only problem with indulging my cravings is most of the time they are store bought and anything but healthy. Even the so called “healthy” chips have way to much fat and little or no redeeming value. Thus my dilemma; how to satisfy my craving and keep it real all at the same time. Sweet potatoes are the “hallelujah epiphany” I came up with. In doing my research on how to transform these nutritious healthy gems into tasty chips, I wanted to find just the right crunch. I found that everyone had a different answer on how to achieve it. The ingredients were mostly the same but the temperatures recommended varied a lot. And so, I ignored them all and set off on my own journey and I’m glad I did. Rosemary Sea Salt Sweet Potato Chips are spot on; baked to perfection for a satisfying crunch. A healthy and whole food treat you can feel good about eating and sharing, though in my case the sharing is a little more difficult…I want to keep them all to myself. Line 2 large baking sheets with parchment paper or wax paper. Set aside. Place 2 tbsp coconut oil into medium sized microwave safe glass bowl. Microwave oil for 30 seconds to liquefy. Add sliced sweet potatoes to bowl and stir gently to coat. Place sweet potatoes onto baking sheets lined with parchment paper in single layer. In a small bowl, mix together sea salt and rosemary. 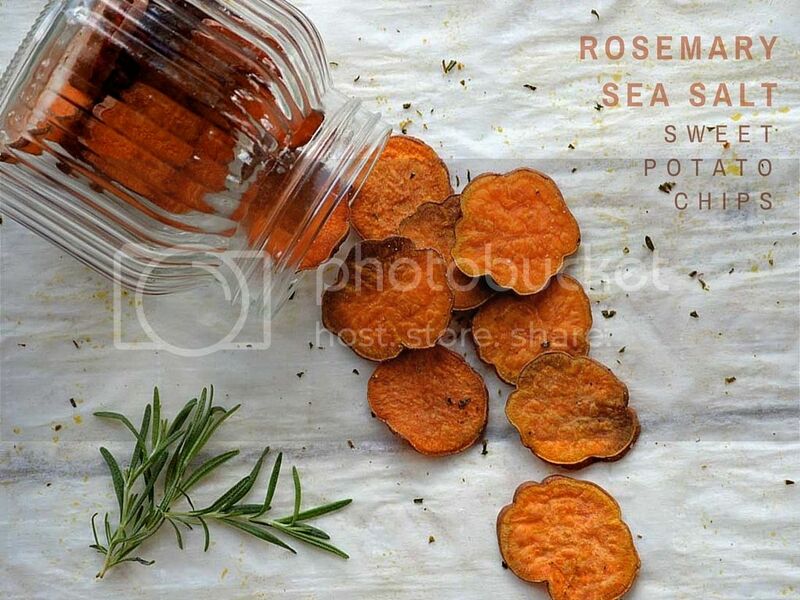 Sprinkle sea salt and rosemary over sweet potatoes. Place sweet potatoes in center of oven (cook one pan at a time if necessary. It's important to have good air flow between the pans). Close oven door and immediately reduce heat to 300 degrees. Cook sweet potatoes for 50 to 60 minutes turning pan 180 degrees every 10-15 minutes for even browning. Once sweet potatoes begin to brown, remove from the oven and let cool completely. The sweet potato chips will continue to crisp up as they cool. Over the past several years my weight has been on the rise and it has insidiously affected every part of my life. My confidence is shot, my energy level is low and I have stopped participating in many of the things I once enjoyed doing. I know weight is not the determining factor of value in life but for me it has been a constant drain on my emotions and frankly I am ready for a change…. Learning sleeps and snores in libraries, but wisdom is everywhere, wide awake, on tiptoe. A funny thing happened this weekend at the Camp Blogaway conference. After weeks of build up, anxiety, and terror, all the while working myself up into a frenzy, once I arrived, I forgot to be nervous. The camp setting was located in a beautiful forested area of Angelus Oaks, in Southern California. As I pulled to a stop at Camp de Benneville Pines , the clean scent of pine rose up to greet me, along with a very large woolly mammoth of a dog, wagging his tail, excited to see me. I took a quick look around and realized I had arrived yet again to another function way too early. Not a big surprise… my eager beaver attitude was out in full force. I hopped back in my car, thinking I would take a little drive to kill some time and came across our fearless leader and the organizer of Camp Blogaway, Patti (Worth the Whisk). She quickly and efficiently sent me off to my cabin to unload and then set me to work, unpacking boxes, keeping me occupied. Nicely done Patti, thank you! All during the weekend I met up with kind and generous bloggers that were willing to impart their special bits of wisdom learned over their years of blogging. My first encounter was with Gary (Cooking Outdoors). His blog is chock full of amazing outdoor grilling, dutch oven and BBQ recipes. His nugget was the importance of getting involved in the community outside of my blog; great advice I plan on pursuing. Next up was Sara (My Imperfect Kitchen). I had already interacted with Sara prior to coming to camp online through social media. In all honesty I was a bit in awe of her and wondered how she had become so successful while holding down a full time job as well. She handled my fawning superbly, was gracious and humble, all the while making a huge impression on me, one I hope to remember and model. While Camp Blogaway had quite a few Alumni, I was not alone in being a first timer. I gravitated toward Louise, another newbie, (Mom Start) right from the beginning. While this was her first time at Camp Blogaway, she was not new to blogging (not by a long shot) with many notable achievements under her belt. In fact, this week she is off to see the premier of Maleficent and then on to an interview with Angelina Jolie! Louise saved me a spot at the table our first evening; figuratively holding my hand and wiping my nose (just like a mom). This was a great comfort in all the newness. The cabin I slept in came with a roomie. I am always a bit nervous, not knowing who I will be paired with. Eureka, I hit the jackpot with Caroline ( The Grateful Foodie); no snoring, no talking in her sleep, and such delightful and enlightening conversation! Her blog consists of information on how to live a full life when one has food allergies and asthma. She does an outstanding job! I could go on and on about the wonderful bloggers I met, but this post would be way too long and no one would finish it. Suffice to say each and every one had something to offer. My biggest surprise though was in the generous, down to earth, fun and engaging sponsors I had the privilege to talk with. Several were already favorites, with products I love to cook with. Two I particularly gravitated towards were Aifric O’Reilly (very Irish don’t you think?) from Kerrygold; producing some of the best butter you can buy anywhere, and Klondike Brands; featuring delicious Idaho Potatoes that are hard to resist. I loved the varieties that were presented. I had no idea potatoes had so many delicious varieties, textures, and flavors. Of course, potatoes and butter go together so I am sure I will be cooking up something special in the kitchen to commemorate with in the near future. All in all, a memorable trip filled with plenty of information to stuff in my brain. The trick now is to put it to good use. Can’t wait to get started! I recently made Seared Salmon with Fennel and Sweet Pea Salad at the request of my Mother for her Mother’s Day gift. I was visiting San Diego at the time and wanted to do something special. She chose this dish with Gazpacho with Grilled Shrimp and Avocado. Never content to leave well enough alone, I tweaked the recipe here and there from the Eating Well Recipe she had chosen. The salmon was moist and cooked to perfection and the slaw was amazing. This is one dish I am sure to make again and again. Thanks mom, great choice! Combine lemon juice, 2 tbsp olive oil, shallots, raw sugar, ½ tsp salt and ¼ tsp ground pepper into a large bowl, setting aside 2 tbsp in a small dish. Slice top of fennel bulb. Chop 2 tbsp of the frond and place in large bowl with dressing. Core and slice the fennel bulb thinly. Slice snap peas thinly on the diagonal into long pieces (about ¼ inch). Add fennel and snap peas to the large bowl, toss well. Cover and chill until salmon is prepared. Cut salmon into 4 pieces and season with remaining salt and pepper. Heat remaining oil in a large non stick skillet over high heat. Add salmon and cook on high heat for 2 minutes, reduce heat and cook an additional minute. Gently turn salmon, cook for 1 minute and turn off heat. Allow to sit in pan for two to 3 minutes. Salmon should still be slightly pink in the center, opaque towards the outside. Place salmon and salad on 4 plates and drizzle all with reserved dressing. This weekend I am heading to the mountains in Southern California for a blogging conference and a whole gamut of emotions is playing havoc with my mind…excitement, insecurity, fear; you name it. Mostly I feel inadequate. The honest truth is, most days when wading into the blogging pond, I feel like a fish swimming upstream, struggling against the current, without the slightest clue of what I’m doing. I stress about whether I’m staying on task, paying enough attention to Search Engine Optimization, or where the perfect balance lies for pinning my posts on Pinterest. All the unknowns and unanswered questions can make my head spin, my heart beat faster, and leave me with an uncertainty of what to do next. My blogging thus far has been kinda like the analogy of the blind squirrel and the acorn, every once in a while I bring one home. It was much different in my former career as an operating room nurse. After all, I had been in the nursing profession for 18 years. Here, I was well respected, knew my job inside and out, and on most days, didn’t suffer from any lack of self confidence whatsoever. I knew exactly what needed to be done and set about doing it…I was the one someone might come to looking for answers, not the other way around. I was good at what I did and I knew it, but it didn’t happen overnight. It took years of practice, learning and self discipline. I had to stretch myself to get over my fear of standing up to doctors when needed, and hone my skills of observation to give the very best care I could to my patients. And so, I find it is time to stretch myself once again; re-learn how to be relaxed outside my comfort zone and acknowledge it is okay when I don’t have all the answers. Most importantly, I need to continue putting one foot in front of the other and not get discouraged when the road gets rough. A step backwards now and again is not unusual. This is a journey, and one that I am fortunate and happy to be on. I have the privilege and opportunity to do what I love, and so I have already won! Therein lies my true success. Today’s recipe is all about cold and fresh. Gazpacho is so deliciously complex with multiple flavors to tantalize the taste buds. Use only the freshest of ingredients and serve well chilled for best results. Recipe adapted from The Art of Mexican Cooking by Jan Aaron & Georgine Sachs Salom. Heat grill or broiler to 400 degrees (high heat). Place shrimp in plastic ziploc bag. add lemon juice, a few grinds of black pepper and a pinch or two of sea salt. Close bag and gently shake to allow shrimp to be well covered with marinade. Allow to sit for 5 minutes. Remove shrimp from bag and place on skewers. Place shrimp on grill (or in broiler) for about 5 - 6 minutes, turning once about midway through cooking, until shrimp is bright pink in color. (do not overcook or shrimp may have a rubbery texture). When pink, remove shrimp from grill.Allow to cool for 5 minutes, remove from skewers. Cover and refrigerate. Meanwhile, place blanched almonds, garlic and chili oil in pestle (or on cutting board) and mash until ingredients becomes a paste. Place in the bottom of a medium sized earthenware or pottery bowl. Place tomatoes on broiler pan, and broil for 5 minutes or until tops of tomatoes begin to singe and split. Turn tomatoes and broil, doing the same as above to the other side. Remove tomatoes from broiler and allow to cool for several minutes. Peel tomatoes, and chop into large chunks, taking care not to crush the tomatoes and reserving juice from the tomato. Place all into bowl with almond and garlic paste. Add onions, peppers, cucumbers, olive oil, tomato juice and red wine vinegar. Chill in the refrigerator overnight or for several hours to allow flavors to blend. Once soup has chilled and when ready to serve; ladle into large bowls and top with 3 or 4 large shrimp and chunks of avocado.